I don't identify as black, but my genes would beg to differ, or at least offer evidence for me to reconsider my self-labeling as a white Latino. My light skin color is less revealing than it may seem. My family tree provides a more complex picture of my racial identity. Two of my great-grandparents were black. Many of my other great-grandparents were of mixed skin color. Two of my grandparents had darker skin. Using fuzzy math, I could argue that I'm nearly half black. That would be true for many Latinos, if not most. Despite my bloodlines, I don't identify as black. The simple explanation has to do with my light skin color; if I had darker skin, it would be much easier to make the case. The less simple answer is that race and racial identity are not so simple. Things like culture, socioeconomics and life experience come into play. Some of us have the luxury of being able to choose how to identify racially, but based on our appearance, most of us do not. As a result, society labels us and we then label each other. Those labels carry assumptions and lead to consequences. For black people, those consequences too often can be deadly. The Black Lives Matter movement was born out of frustration with those deadly consequences. Although the deaths of black people at the hands of police remain a focus of the movement, the idea of confronting violence committed against black bodies in general has expanded its scope of advocacy. Our cover guy, Ashton P. Woods of Black Lives Matter Houston, is a great example. As an HIV-positive gay black man, Ashton brings all those identities to the table. 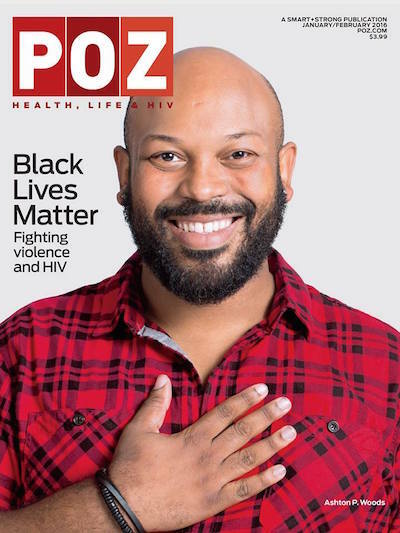 Black Lives Matter activists are now finding common cause in fighting violence and related issues like HIV. Click here to read more about the intersections of both movements. Black leaders were fighting HIV/AIDS at the beginning of the epidemic, and many of them do so now. Some live with the virus, and others don't. That's not unusual. What is rare is having two experienced HIV-positive black leaders team up to lead policy advocacy. Such is the case at amfAR, The Foundation for AIDS Research. Greg Millett and Kali Lindsey are that duo. Greg is a vice president of amfAR and director of the public policy office. Kali is deputy director. The combination of Greg's research experience with Kali's grassroots know-how is a winner. A priority we all can relate to is finding love. It's never easy for anyone, regardless of HIV status, but living with the virus can make dating even more difficult. Although four people offer advice, five people offer disclosure tips. The fifth person is Rae Lewis-Thornton. We first asked her to contribute to the disclosure story, then realized she had more to share. Click here for what the blogger and activist has been up to in the two decades since she graced the cover of Essence magazine.